"Saint Bruno Praying in the Desert"
Shortly after Bruno was ordained, he worked as a college professor, and then he was appointed chancellor (chief assistant) to the archbishop. But all he wanted to do was live a quiet life and focus on Jesus. He and six others were given a lonely area in the mountains to build their home, and they became the Carthusian Order. They chose to live a life of poverty, working with their hands and prayer. Bruno was very happy with this, but Pope Urban II – Bruno’s former student – asked him to come to Rome as an advisor during a time when there were a lot of problems with priests. So, Bruno went to Rome until he could persuade the pope to let him start another monastery. 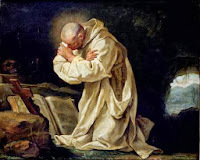 When Bruno died, there was no question that he had saintly virtues, but he and the other Carthusians reject public honors, so Bruno was never actually canonized a saint. Still, the Church recognizes Bruno with a feast today. The Carthusians live in total silence so that each of them can be constantly in prayer to the Lord. Today, give your family the gift of silence and see how much easier it is to pray when Jesus is the only person you can talk to. How long can your family remain silent? The documentary, Into Great Silence (2005) can also help you see what it’s like to live as a Carthusian (trailer here). Try playing the movie as you go about your daily chores and activities at home, remaining silent like the Carthusians are. Saint Bruno, pray for us!